So, wow, it’s been another long while since my last post, and I feel like a very lazy, bad blogger. It seems like every time I post, I say some version of this. It’s not like I haven’t been sewing–I really have! I’ve sewn A LOT since my last post, and some of it has even been for ‘real life’ rather than my historical dress-up activities, so there’s plenty to post here. Still, I think I want to start with something slightly older than a year, since they have become staples of my wardrobe and a Tried-and-True (TNT) pattern for me: the True Bias Sutton Blouse. I really love this style, how easy, comfortable and chic the top looks. 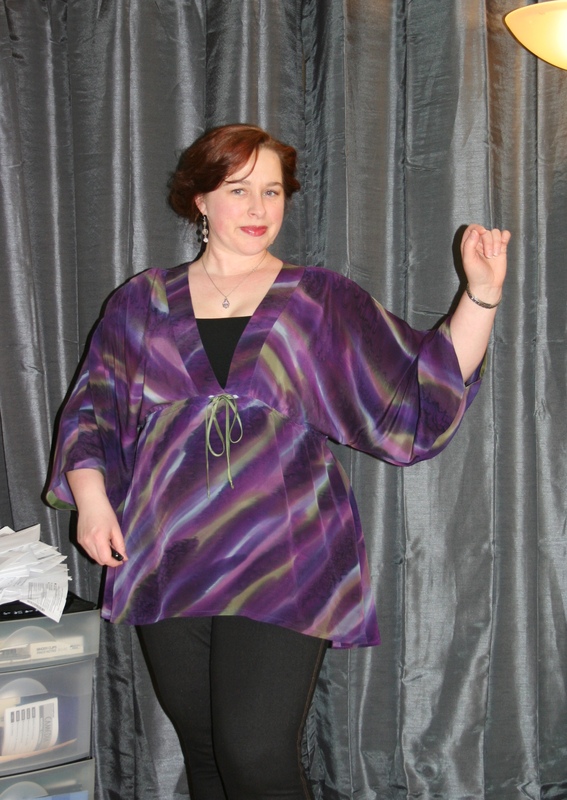 I like the kimono-style sleeves and the shoulder yoke, which makes mixing fabrics easy. The back inverted pleat ensures plenty of movement. I love that the yoke is French seamed to give a clean finish, and the seam finish on the side seams gives a great finish, too. I really love how the instructions are written and the fact that the neckline finish–usually the toughest part–is done almost immediately to get it out of the way, and it works really well. Although, I needed a longer bias strip than the pattern provided. The only fitting change I made was to lengthen below the bust apex area to accommodate my longer bust curve. That’s it. It’s so roomy I didn’t bother with anything else. These blouses are fantastic to wear under a blazer with skinny jeans. I love the layered, relaxed look they give to this kind of outfit, with their loose silhouette, luxurious fabrics, and the hems that peek from under the back of a blazer. For my first version, I used a silk broadcloth in a really cool shattered plaid/marbled print that I got as a 1 1/8 yard remnant; this was for the main body. Since there wasn’t enough for the body and yoke pieces, the yoke is a cotton/acrylic lace with very little stretch. And yes, blue and black are mixed together in this top. I used a bias-cut hand-dyed silk ribbon for the bias facing. This one is in a lightweight silk jacquard, deep black. I shortened the length from my first version slightly. Otherwise, none, not even for my normal fitting issues because it’s such a loose fit they don’t really show up. I used a bias strip of the fabric to finish the neckline. Both in hand-dyed/painted silk charmeuses. Version 3 has a solid-color contrast silk charmeuse yoke. Bias strips of the blouse fabrics finish the necklines. But I lost the photos I took of version 4 in a hard drive crash a while ago, so I’ll have to take new ones. Version 5 is currently a UFO, and has been for nearly 2 years now! I got really distracted by other projects. It’s a lovely hammered silk charmeuse in ivory. My goal is to finish it before this winter ends, as these tops are ideal for the winter/spring transition (and for fall!). A couple years ago, I made the Sutton Blouse into a shift dress that … well, basically looks like a brown paper bag. I call it my paper bag dress, in fact. But it’s very comfortable and breezy and great for hot, sticky summers, as it’s made from a beige linen/rayon blend (with a gold Lurex thread). It has the same shape/silhouette as the blouse, the same high-low hem, it’s just longer–about knee length. However, I don’t like exposing my knees (hello, work-pony physique), so for any future versions–and I do want to make some–the front hem will be lengthened to match the back. The wrinkles from sitting all day in this dress pull the front hem up even more so it looks way too short. But really, the hem falls to just above the knee. Well, that’s catch-up post #1. I purchased two button-front shirts and a knit maxi skirt in June, and it felt like a failure. But it was necessary to refresh my spring/summer wardrobe just a little because I realized that no matter how much I might want it to be the reverse, I simply can’t sew fast enough to make everything that I want to make for this season. And boy is there a lot. My dining room table has been COVERED until recently with freshly washed and pressed fabric just waiting to be cut and sewn; the table is still half-covered. I know I have to spread it out over weeks and months and focus on sewing the simple things for everyday summer wear. But I have such high ambitions and I want to sew so much, and there are many reasons why I’ve given up clothes shopping (for the most part; I won’t spend my time sewing undies and jeans—yet). Finding something I like enough and that fits well enough to buy in the store has always been a job and a half, which only serves to reinforce my desire to sew more clothes. But I’ve learned recently that when things at work or in other areas of my life are sucking my mental and emotional energy, there’s just not much left over for sewing. I go into a funk for a week or two, sewing and projects sit or only minimal progress is made on them. And then I come out of it, and get to work again. But this feeling of failure because I had to BUY some clothes … it was surprising. So to remind myself of what I actually have accomplished in the way of creating a home-sewn* wardrobe, I decided to post a round-up of the garments I’ve sewn in the past three years, since I really started sewing seriously again. That should help dispel this sense of failure. 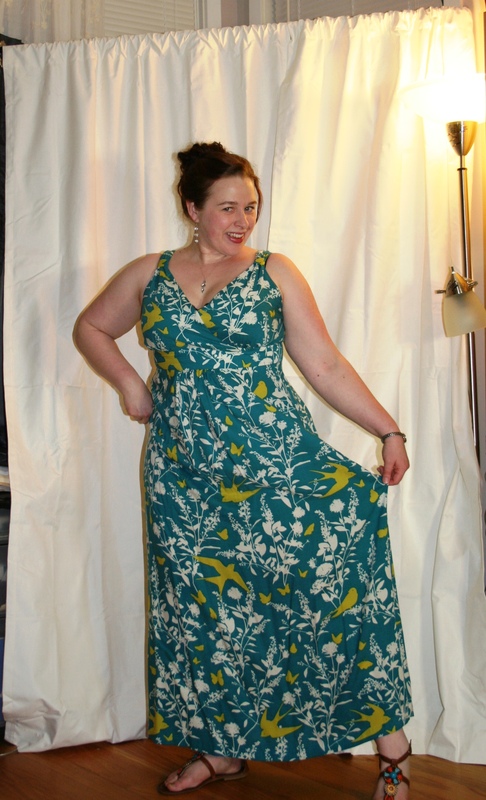 First up, the popular Sewaholic Cambie dress. I made this in 2012. 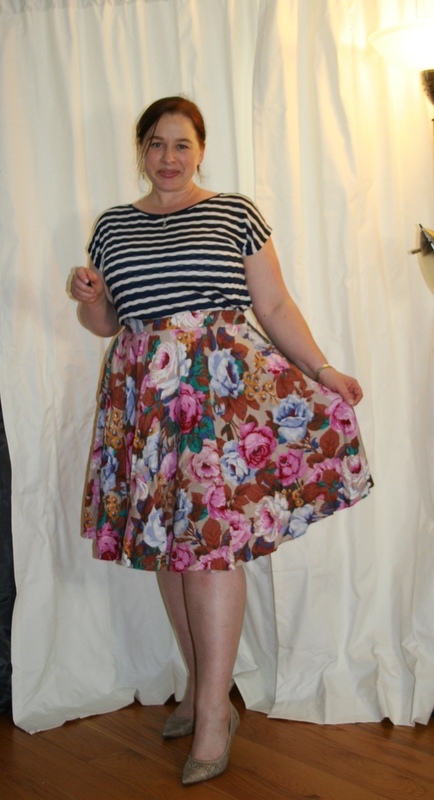 It’s cute, the pattern’s well-drafted, and I didn’t have to make too many fitting changes since Sewaholic’s creator drafts patterns for a pear shape, and bust measurements on her sizing chart go up to my bust measurement. I made it out of deep purple cotton Swiss dot and lined it with pale pink cotton batiste. It’s a bit fluffy for my current taste, due to the full gathered skirt, but I think I can re-do it by re-cutting the skirt into the A-line option. I may do it eventually. But it’s a fun dress to wear, regardless. If you want to read my review of the pattern, it’s here, on PatternReview.com. 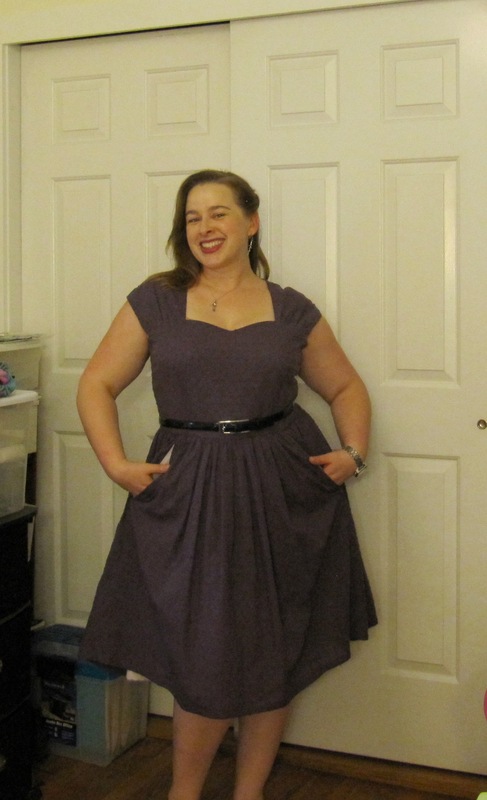 My fluffy purple Sewaholic Cambie dress. I have a thing for dresses, so most of what you’ll see here will be dresses. They’re so easy to throw on in the morning and they’re an outfit all on their own but accessorizing them can turn the look into something completely different. 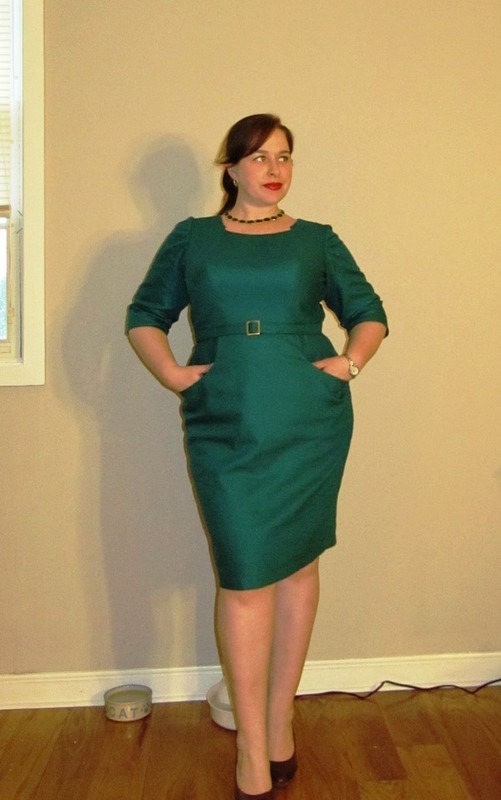 Next up is an emerald green, tightly fitted sheath dress from the Sew Chic Beatrice dress pattern. This thing is over-fitted and the bodice fit is way off. I didn’t fully understand my proportions and how to make a pattern fit them until very recently, despite my years of sewing experience. I made this in 2014, so the fact that it’s so poorly fitting and what I sew now is much better fitting says something. I only wore this dress while filming some sewing tutorials. It looks good enough when I’m standing, but sitting is uncomfortable because I took someone’s suggestion to peg the skirt a bit, which looks good, but unfortunately doesn’t accommodate how my lower body spreads when I sit. Oh well. 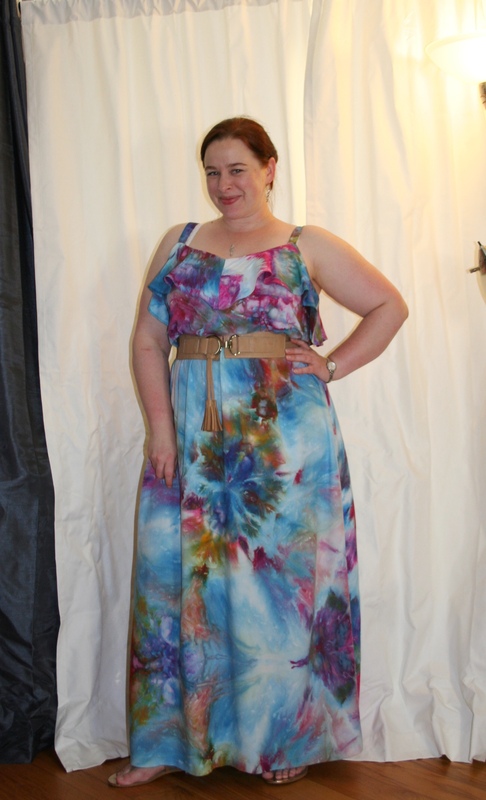 But I really like the idea of this dress, the color, the fabric I used, and I like the pattern. I just have to completely re-do it from scratch. And I will; I even bought more of the same fabric I used for this one so that I can have the dress I really wanted–with a better fit. Again, click here for my review of the pattern. My Sew Chic Beatrice dress is actually ill fitting, despite the fact that it looks pretty good from a distance. One of the more recent tops I’ve made, this is Simplicity 1896, a kimono-style tunic with bag sleeves. I’d been hoarding this gorgeous purple hand-painted silk crepe de Chine for a couple years since I purchased it (for $$$) at a sewing expo. This tunic was the perfect thing to turn it into. I love this fabric; its so beautiful and yummy and wearing it is a lovely experience. (I have a serious weakness for anything silk.) This was one instance where I was afraid to cut into the fabric, but once I did I was thrilled and I’m so glad I didn’t let that fear of ruining it keep me from using it forever. My review here. 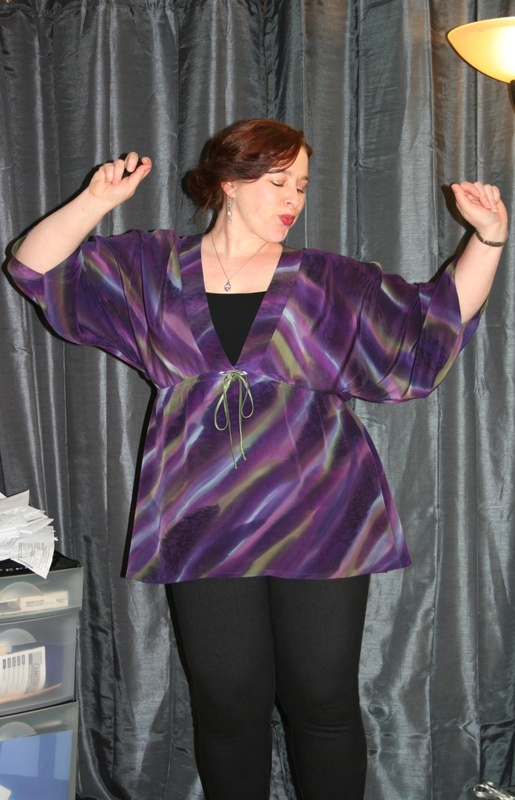 A hand-painted, silk crepe de Chine kimono tunic, Simplicity 1896. This is one of my very favorites, and I will be making more from this pattern, eventually. New Look 6774, which I called the Peacock Nebula dress. I hand-dyed the rayon twill fabric myself using the ice-dye process, and I’m fascinated by ice-dyeing now. My last New Look 6774. It’s time to retire this pattern. Too much boobage! 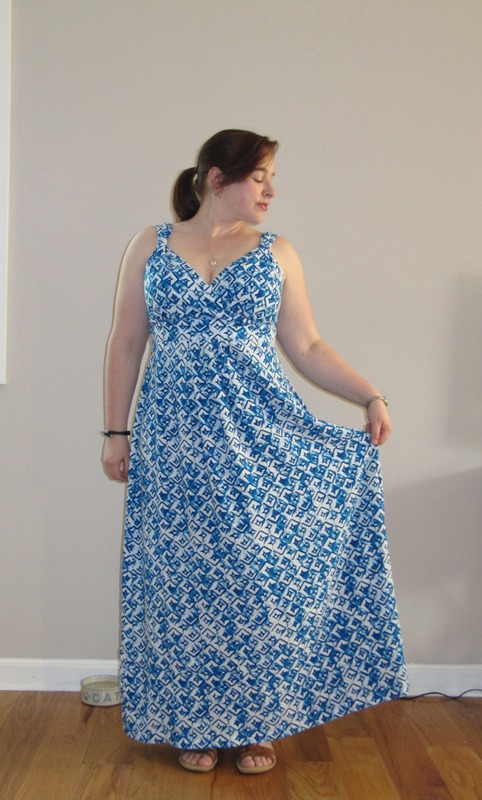 Another New Look 6774, this time in printed rayon challis. So comfy to wear. It still has its Peacock Nebula thing going on, but the bodice gives more coverage now and isn’t as strangely droopy as it was as NL 6774. Whew, just two more for this post. Okay, next is a circle skirt that I drafted to my measurements in 2014 and made from a drapery fabric that I found in a home décor fabric shop. It’s cotton; but beyond that I have no idea what the weave is supposed to be. It stretched like hell on the bias, even after I let it hang for 1 week before hemming the skirt. It drapes like a challis, but it has a slightly brushed, flannelly feeling wrong side. The print is pretty, but old fashioned; I fell in love with the fall colors. This looks killer with cognac boots in fall. The circle skirt of doom, which continued to stretch on the bias AFTER hemming, so I had recut and sew the hem. Shown with one of my Maria Denmark Kirsten Kimono Tees. I don’t make many skirts; they fit my curves oddly and tend to shift around as I walk and they don’t sit securely at a place on my waist that I want to draw a lot of attention to. But it’s nice to have some on hand. I really love this tropical print rayon challis sateen–so called because it has a superb glossy finish on its right side due to longer yarn floats than a typical challis. 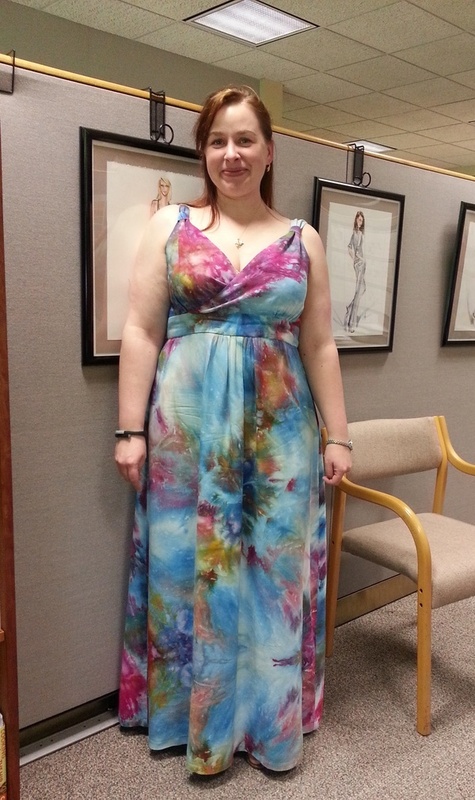 This pleated maxi was self-drafted to my measurements this summer (2015). I usually wear it with a sequined tank and a navy or white cardigan, but it doesn’t look too bad with a striped tee. 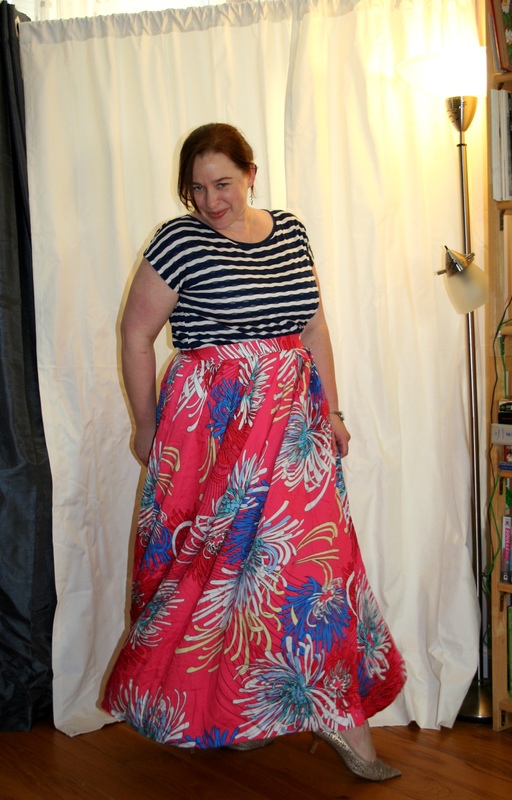 A self-drafted pleated maxi skirt in lovely rayon challis sateen. Skirts are problematic for me, but sometimes they’re the best dressing option. Well, that’s a brief update on some of the sewing I’ve done in the past few years. There’s a lot more, but there’s more to say about each of those others, so they’ll get separate posts. This is just to get me started! ** To anyone reading this that gets their undies in a bunch because I’ve just cast aspersions on a phrase you like to use because it sounds cute or something—this is no reflection on you. This is my personal preference, and these are my opinions, and it’s my blog, and I’m allowed to say whatever the hell I want.